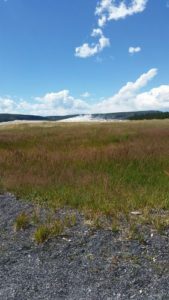 In this final installment of Quammen’s article about Yellowstone, he talks about the Greater Yellowstone Ecosystem. 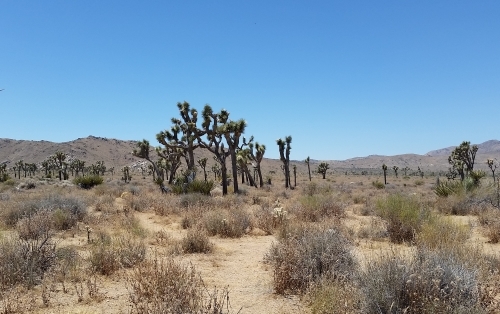 He discusses where the term came from, the area it relates to, and how the park itself is impacted by things that happen in the “greater ecosystem” in general. You see, the Greater Yellowstone Ecosystem is not just the park itself, but the surrounding area. One of the biggest problems is that, well, there are people in the Greater Yellowstone Ecosystem, and people have an impact everywhere they go. Most notably, once an animal leaves the park itself, it becomes potential prey for human hunters. And since the park is not fenced off, animals are entering and leaving the park all the time. Additionally, some of the bison can carry brucellosis, a disease that can be transmitted to cattle and that causes cows to miscarry their calves. No cases of brucellosis being transmitted to cattle from Yellowstone bison have been found yet, but the potential is there, which causes conflicts between ranchers and the park. The copy of the issue that I have (and likely the same layout that everyone got) suddenly stops in the middle of a sentence on page 137. We go on to some other material for four pages, and then we pick up where we left off on page 142. There is no “(continued on page 142)” or anything. Quammen has no answers to the questions about what will happen to Yellowstone in the future. 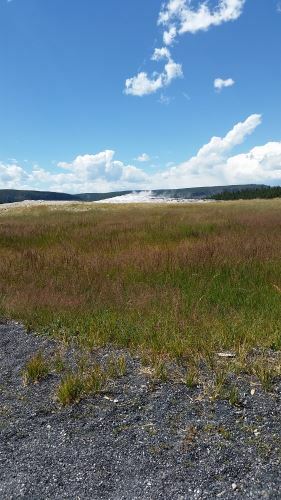 One of the people he speaks with, Dave Hallac, former chief of the Yellowstone Center for Resources, says that Yellowstone is facing a “creeping crisis”and doesn’t hold out much hope for the park. Is Hallac right? 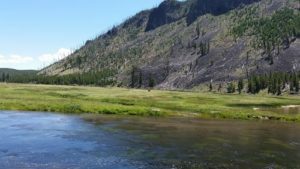 The scientists involved with Yellowstone are hoping they can forestall the crisis and save the park. Sorry for the gap, but I’ve been stressed out lately and so dealing with that took precedence over blogging. I need to get more prewritten posts racked up before this happens again. Oh, well, this is a learning process, isn’t it? In this part of the issue, we talk about wolves, grizzlies, and elk. Quammen spends a while talking about changes to the environment and the introduction of lake trout to Yellowstone Lake. You’d think that lake trout would thrive in Yellowstone. And you’d be right. The problem is that the lake trout are thriving just a little too much. Grizzly bears eat cutthroat trout. The cutthroat trout eat bugs on the surface of the water and come into the rivers to spawn which make them available for the grizzlies to eat. At least that’s how it’s supposed to work. The lake trout outcompete the cutthroat trout and are also basically unavailable to bears. The lake trout eat crustaceans from the bottom of the lake and also spawn down there, meaning that their nutrients are locked inside their bodies for too long to support the grizzly. As a result, for the last five years, Yellowstone has hired a company from Door County Wisconsin which brings boats and nets and slaughters literally tons of lake trout every day. The dead lake trout are then dumped back into the lake so that their nutrients will be available to the ecosystem once again. Quammen doesn’t believe that this will end the reign of the lake trout, but the humans are trying the best they can to restore the balance to the ecosystem. Tracking the Wildlife Highways, another pictorial, this time of migrations, including a section on the migration of pronghorn.